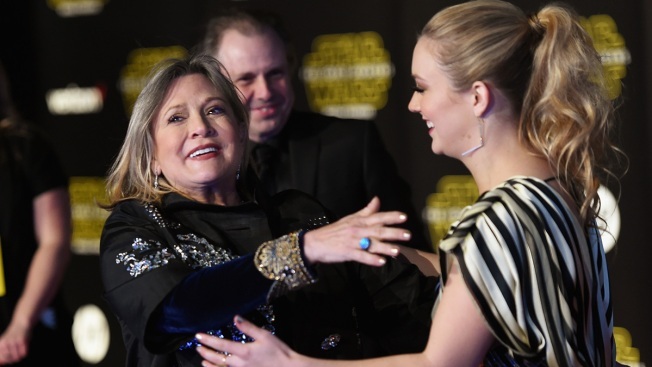 In this Dec. 14, 2015, file photo, actress Carrie Fisher, left, runs to embrace her daughter, actress Billie Lourd, at the premiere of Walt Disney Pictures and Lucasfilm's "Star Wars: The Force Awakens" in Hollywood, Calif.
Actress and writer Carrie Fisher — best known for her iconic role as Princess Leia in the "Star Wars" movies — died two years ago on Dec. 27, 2016, days after suffering a heart attack on a flight from London to Los Angeles. 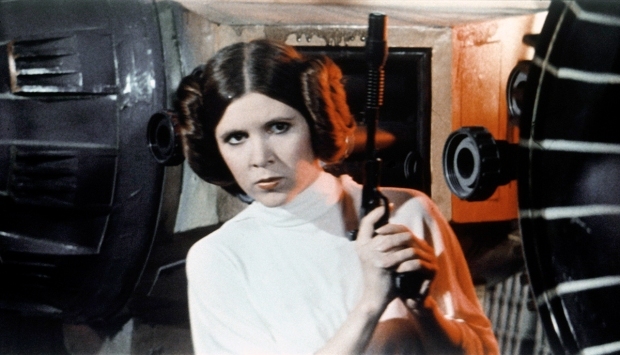 "It is with a very deep sadness that Billie Lourd confirms that her beloved mother Carrie Fisher passed away at 8:55 this morning," the family's spokesman Simon Halls told E! News in a statement at the time. "She was loved by the world and she will be missed profoundly. Our entire family thanks you for your thoughts and prayers." Just one day after Fisher's death, her mother, Debbie Reynolds, died at the age of 84. To mark the two-year anniversary of Fisher's death, Lourd took to Instagram Thursday, where she posted a video of herself at a piano playing a cover of Nico's "These Days" in her mother's honor. "It has been two years since my Momby's death and I still don't know what the 'right' thing to do on a death anniversary is (I'm sure a lot of you feel the same way about your loved ones)," Lourd captioned her post. "So I decided to do something a little vulnerable for me, but something we both loved to do together - sing." "This is the piano her father gave her and this was one of her favorite songs," Lourd continued. "And as the song says, we must 'keep on moving'. I've found that what keeps me moving is doing things that make me happy, working hard on the things that I'm passionate about and surrounding myself with people I love and making them smile. I hope this encourages anyone feeling a little low or lost to 'keep on moving'. As my Momby once said, 'take your broken heart and turn it into art' - whatever that art may be for you."